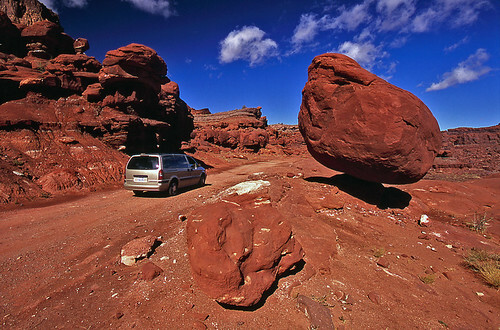 Balanced rocks are a geological formation created due to wind/water erosion or glacial melting. 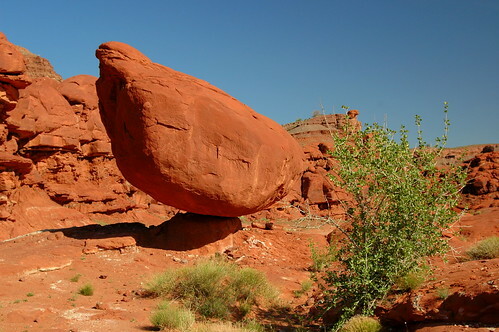 These precariously balanced rocks are wonder of the nature and to a viewer it looks that these would topple by a gentle human push or a whiff of wind. However most of these rocks have remained steadfast for past several thousand years though some were vandalised and pushed over. To some scientists these rocks are a sign of seismic stableness of the location. Image from Panoramio is by Tom C.
I have not been able to find information about his rock. May be some of my readers who have been to that area can throw some light on this. Credits: Special thanks to Syzygy for bringing this to my knowledge. He has made many great posts in the Google Earth Community including about Hungarian National Parks.